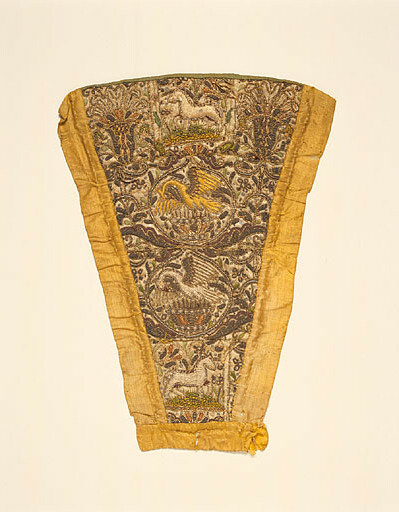 White satin, embroidered in sections, backed with linen canvas and lined with linen printed in blue; edged with yellow silk; triangular shape cut off at base; raised embroidery in colourd silks, metal thread and spangles; design of pelican and unicorn set in formal scrolls, worked mainly in laid threads with some satin stitch. Block printing is one of the most ancient methods used to print a pattern onto fabric, and it is also one of the simplest, being in essence rather like potato-cut printing with which school children experiment today. The pattern is first cut in relief into a block of wood, and if the design is complicated narrow slips of flattened copper can be added to give a sharper outline. The dye is then spread evenly on the block, which is carefully placed onto the fabric. 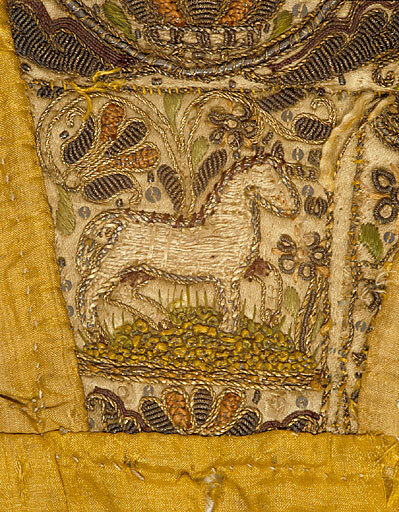 As the block is usually smaller than the length of fabric, small pins at the corners of the block can be used to line up the patterns, and the marks that the dye can leave on these pins provides evidence that the fabric has been block printed. Block printing by hand could be tortuously slow to undertake. It has been calculated that in order to print a length of calico twenty-eight yards or about thirty metres long, and thirty inches or about a metre wide with three blocks each measuring nine inches (23cms) by five inches (13cms), the printer would have to apply the blocks over 2,000 times! 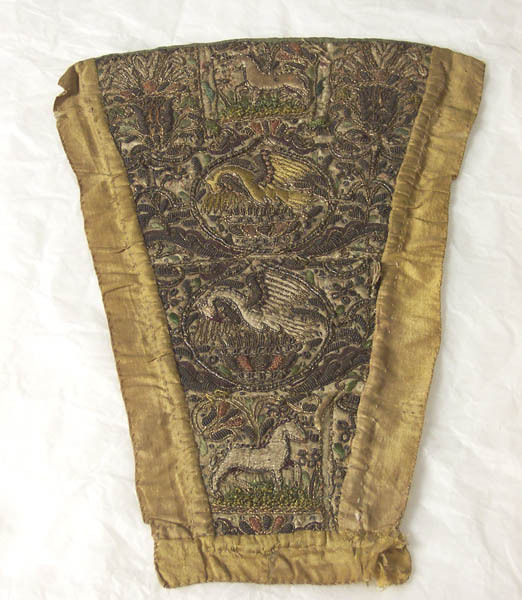 It is therefore hardly surprising that inventors and entrepreneurs sought to find new methods like roller printing to speed up this process, and thus to cheapen the price of the finished fabric. 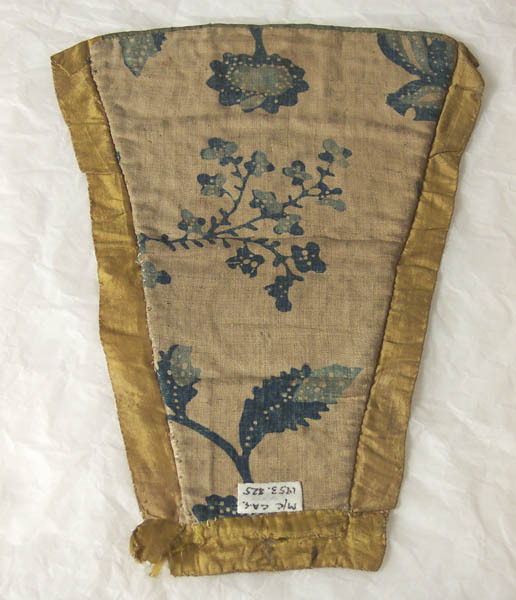 Early block printed linen and cotton, from the 1730s to the 1760s, survives often as linings, as in the three stomachers pictured at the end.